“BRAVERY”, MARIE COLVIN once said, “is not being afraid to be afraid.” The war correspondent had enough experience of those states to express this gnomic utterance without fear of contradiction or derision. Born in Oyster Bay, Long Island, and educated at Yale, Colvin made her name covering conflicts in Afghanistan, Libya, Iraq and Syria for the Sunday Times. After losing her eye in a rocket-propelled grenade attack in Sri Lanka in 2001, she wore a black eye patch, which she said made her look like a pirate. Behind the jokes and the glamorous image she cultivated, however, was a struggle with PTSD and alcoholism. Colvin was fiercely ambitious, cared deeply about the work she was doing and the actions she believed her words could spur. Because of that, she could also be reckless in pursuit of a story. She died in Homs, Syria, in 2012, one of the very last Western journalists in the city. Evidence suggests that she may have been targeted in retaliation for her coverage of the conflict. On January 31st a federal judge in Washington, DC, ruled that the Syrian government was liable for her death, ordering Bashar Assad’s regime to pay $302.5m in damages. 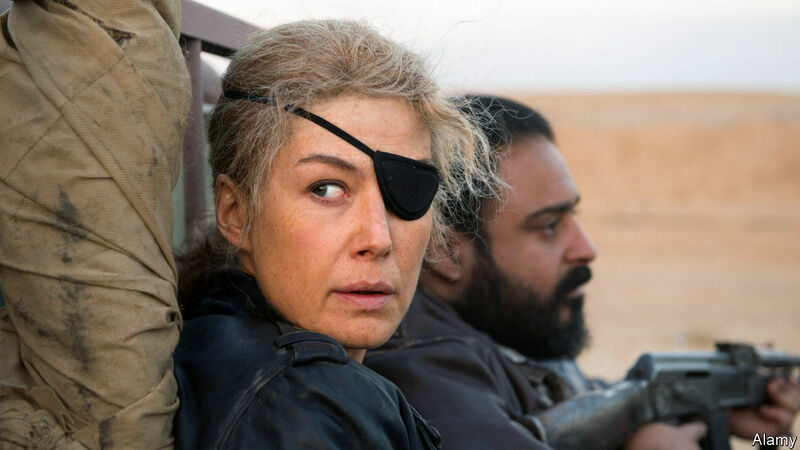 Rosamund Pike, the British actress who plays the journalist in “A Private War”, studied clips of Colvin’s voice and accent when preparing for another role and was increasingly drawn to Colvin herself. This led her to track down Matthew Heineman, the director of documentaries “Cartel Land” and “City of Ghosts”, who she heard was making a film about the late reporter. Whether consciously or not, the reasons she gives for landing the role are Colvin-esque. “He wanted a partner who would dig in with him,” she says. Over many months they interviewed Colvin’s friends, colleagues and family, seeking their blessing and teasing out their memories to augment the film’s original source material, an article in Vanity Fair by Marie Brenner. Paul Conroy (played in the film by Jamie Dornan), a photographer who worked closely with Colvin and was with her at the time of her death, eventually agreed to be a consultant. “A Private War” zig-zags through the final decade of Colvin’s life. One scene depicts her desperation to cover an unreported humanitarian crisis in Sri Lanka—this was the trip that cost her an eye. Later, she struggles to find stability and recognition in her job at the Sunday Times in London. Rows with her ex-husband; struggles with body image (she was a fierce dieter); a steely interview with Muammar Qaddafi; the discovery of a mass grave in Iraq; trauma-induced hallucinations; the fateful meeting with Mr Conroy: through all this, the camera does not flinch. Next PostNext Nissan snubs Sunderland. Is Brexit to blame?